Which way will he turn? I been lacking in my post and I apologize to you. I been battling an old foe for the past few months—self-confidence. I am in the process of publishing my third full-length novel. This one was my first manuscript and has taken a great deal of work to bring it to publishing standards. I always fear for my children—my books—but this one is special. I’ll write more about it later. Oh, look! A picture of the front cover is on the left side of your screen. I traveled to north Thailand with my wife, daughter and a friend to see the Long-Neck women of the Karen hilltribe. We drove through the beautiful mountains, around impossible curves with new wondrous scenes beyond every turn. Mist covered rivers and slopes gave a primordial feel that we were traveling back in time. Bright clear sunshine and giant Teak trees casting dark shadowed gates across the road as if we were passing from realm to realm. There was silence in the car as we beheld the beauty of this trail into the mountains. And of course I had to watch for the manic drivers coming from the opposite directions who gave no care as to which was actually their side of the road—Most invigorating. We traveled off the main road near the village of Mea Hong Song that is nestled in a high mountain valley surrounded by majestic mountains. I drove up a small road high into the mountains just to see where the road led and saw a small turn off which I took. My wife wasn’t too happy about being in the middle of nowhere and very close to the border with Burma (Myanmar). What…, me worried? — I wanted to know. I drove into a family complex of five houses. There were small contoured rice patties and small vegetable plots and it seemed peaceful enough. A few people came out to stare at us and I got out to speak with them. My wife locked the doors after my exit. In my simple Thai—I actually have a country twang to my accent, which the farmers like—I asked if we could look around and see how they lived. Usually when I speak Thai to someone for the first time, the Thai’s look at me as if I were an alien from another world. Actually, I get that wherever I go. They’re just not use to a white guy speaking their language. I spoke to an older lady who had several children standing close by and she spoke and smiled and motioned for us to join them. I think what really helped was not my language skills but my daughter’s friend, Roger, who is a giant of a man. Around six feet three inches tall, a strong body and a former Marine, Roger is impressive. The villagers were around five feet tall and were taken by this gentle giant. I watched a young girl dipping out a mixture from a container and there was a familiar smell to it. I watched her carry the bucket over to a round iron pot that sat over an open fire and pour the mash in. I looked at the bamboo tubes that extended out about ten feet and saw liquid dripping from the end. It hit me with a smile. They were making Moonshine, White Lightening. I had never seen a Moonshine Still quite like this one but there was no doubt what it was. Many years ago, before my time, some of my family made and distributed White Lightening in the rolling hills of North Carolina. Ever hear of Thunder Road? This was a different kind of Lightening—made from rice—so naturally I had to give it a go. Yep, 100% grain alcohol. These kind folks let us explore and ask question and made us feel at home. Roger, the giant, found a tiny man chopping wood and took over the chores. Roger was raised on a farm and knew what real work was. He was a star! 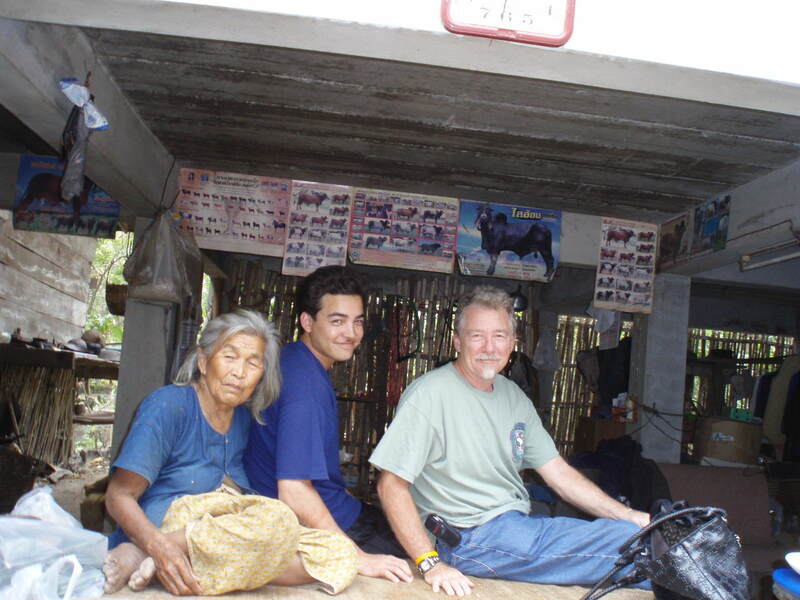 Of all the friendly people I meet in Thailand my fondest memories are the people of northern Thailand. I asked one lady why everyone was so friendly and she told me that there were many people from Burma, Laos, the different hilltribes and of course Thais all living together. It was a must to be friendly. As usual, for me, my hard drive with my older pictures is in one place and I am in another. I will find them and add them at a later date. I blame it on the Moonshine, lol. See my interview by Junying Kirk! Leave a comment and make me smile! 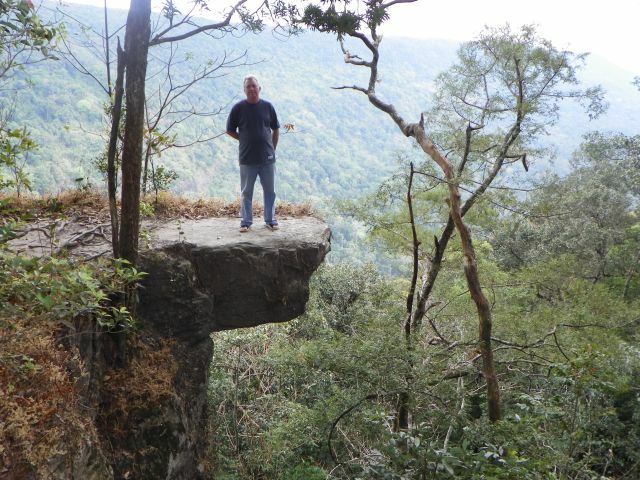 A few years ago I made a trek on my motorcycle. At the time I had a ‘big’ bike. A 850 TDM Yamaha. Over here that is a big bike. The Thais called it a buffalo because of its size and look. I travel to the eastern part of Thailand where the borders of Cambodia, Laos and Thailand meet. It’s rural and a poor area but as always the people are wonderful and happy. I stopped at a small village and asked if there was a place to stay for the night and a pretty young woman offered her family’s house as a stopover. I wasn’t sure what to think but her house was close so I went for a look. I was relieved to find her sister, husband, three kids and father also lived there and they all insisted I stay for as long as I like. Of course the kids took to me right away. These nice people opened their house to me, fed and entertained me. 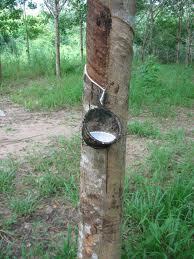 They made their living extracting rubber, latex, from their grove of trees. I was excited because I wanted to see what rubber trees really looked like. I picture the thick leaf, bulbous trunk trees just waiting to pour out their essence to a passerby. Guess what? I was wrong again. We walked at least a mile to their land and as we walked I looked at all the maple looking trees grown in orderly rows along the way. I wonder what they used these trees for and even asked the young husband. He gave me a very odd look and simply said, “Yang”. Thai is a tonal language where every word can have up to 5 meanings by the way it is said. ‘Yang’ to me meant ‘no’ or the rubber tires on a vehicles. It also means rubber from trees—who knew. I figured this out when we arrived at his grove. The trees do look like maple trees and each had a small cup attached to it and a number of very neat cuttings in the bark. The sap from the trees is pure white and sticky. The man asked if I would like to help and of course I agreed. We then turned around and went back to the house—I didn’t understand. Well at around 3:00 am he woke me and handed me the light—I knew there was more to it than making a simple cut. At the grove we emptied every little cup into a large can until it was full and then he allowed me to carry that big can all the way back. I was asleep in moments after my head hit the mat. At 6:00am I was up and helping him pour the liquid into rectangle containers and adding an acid to the mix. I asked, “Are we through yet?” He just smiled. I went off to enjoy the family and kids. It was like show and tell as they took me to each house in the village to introduce their guest to everyone. I was a star! Then around 3:oo pm the young man said it was time to finish—do what? The sap had congealed to a thick sheet and had to be handled carefully. He had a thing that looked like the rollers of a very old washing machine- but much bigger. I got to provide the power to turn the rollers and we flattened out the sheets to about ½ inch thick. We made 20 18×24 sheets and then we hung them to dry. 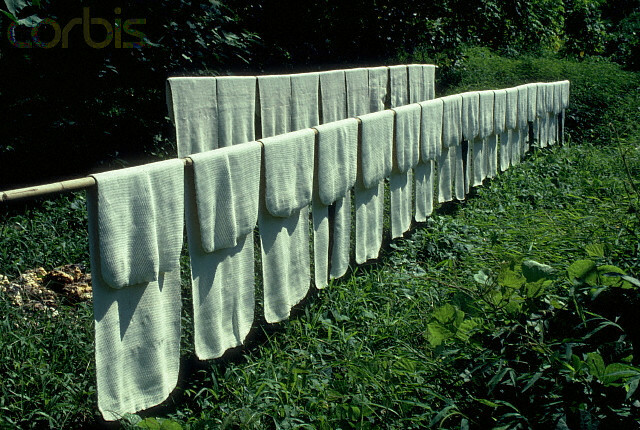 It takes almost a year to dry completely and be ready to sale. He went through this process every other day for two months and then let the trees rest for a month. It takes five or six years for the trees to mature and then they produce for thirty more years. I stayed for a week but only helped that one night. The village had parties- not on my account- and everyone visited everyone else. These were happy people and they took me in as one of their own. The next time you put on rubber gloves, see a car rolling down the road, wear a rain coat or see anything made of rubber you might think of these hard working people who get very little for all their effort. I know I do. I hope you enjoyed this small tale of a writer living in Thailand. Thank you for reading and I hope you’ll comment! The first photo is at the airport just before our son headed for the States. All the flowers are orchids. The second is a tree near our house. 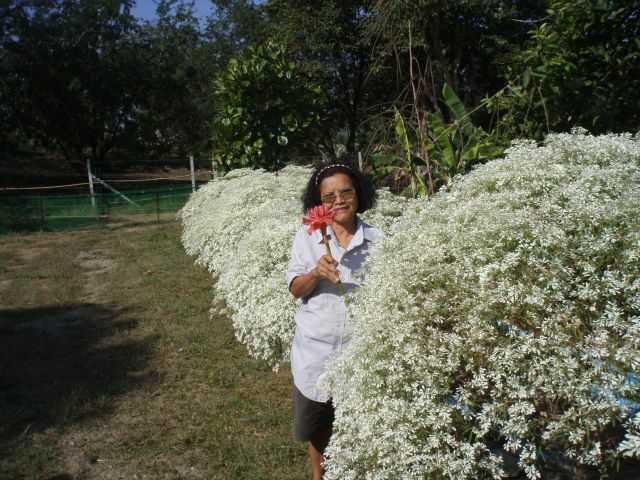 The third is one of my orchids and the fourth is Julee in a hedge of white Christmas– that’s the Thai name– at our little farm. She’s holding a flower that last for months after it is cut. Look like it’s made of plastic, but beautiful. 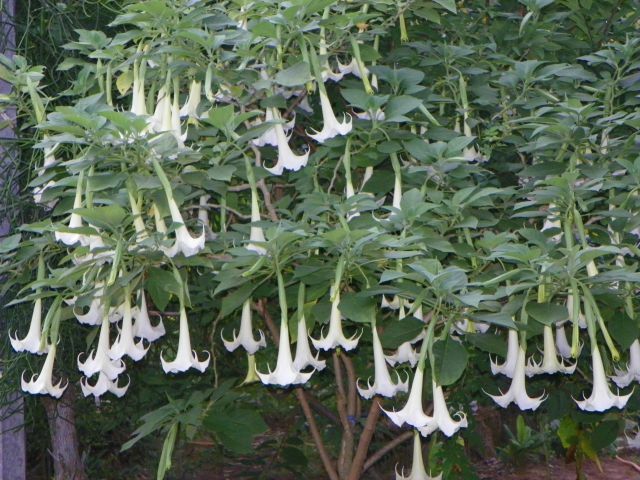 The last is an Angel’s trumpet tree outside my front patio. I’ve been away for a few weeks and I apologize for that. Have a number of excuses: Rains, flooding, son’s visit, bad internet… Oh, and preparing a new book to be published soon. I’m once again at the farm and doing farm things in my spare time, but sometimes I just sit by our pond and look at the flowers. Just about everything that grows in Thailand makes beautiful flowers. What surprised me the most is many of the flowers are eatable. My wife asked me once when she was new to the States, “Why are there so many trees but you can’t eat them?” I thought it a strange question until I moved here. 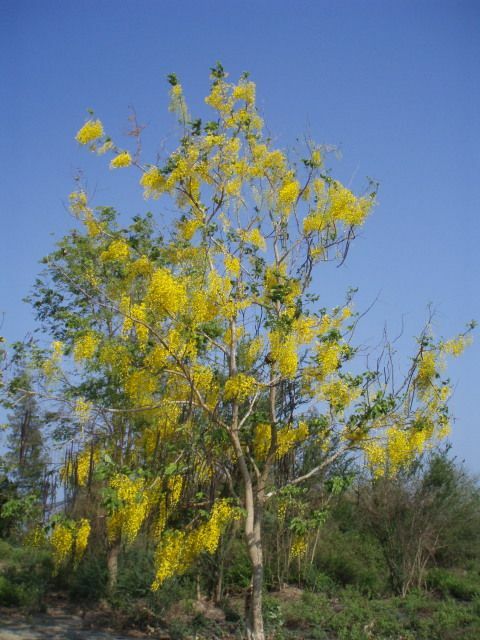 When trees along the roadways are flowering it looks like a market place as everyone stops to pick a large bag of flowers to take home to eat. I’m not talking about the myriad of fruit trees, but the ordinary trees. They come is every color too. I must say I’m not a big eater of trees. Most flowers have a bitter taste and the Thai’s love them. My wife always tells me they are good for the heart and I tell her I don’t eat medicine as a regular part of my meal. I do my part by helping to collect the flowers but in truth I would rather sit and admire them. 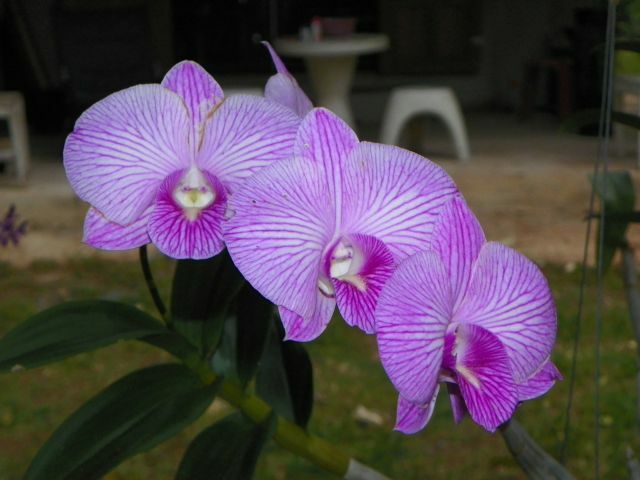 I grow orchids and here it is so easy. I’ve tried a few times in the States only to watch them die because I couldn’t figure out what to do and when. In Thailand I buy these beauties and just hang them from a limb of a mango tree that grows outside my front door. I even give them food once in a while—whenever I want—and they grow and flower and ease my mind as I look upon them. Orchids fascinate me because they thrive on the rain and air and very little else. And their flowers last for weeks. Some I have even have a fragrance—most don’t. Orchids grow in the forest high in the trees and there are a number of orchid farms that ship these wonderful flowers all over the world. Almost every home has several orchids hanging on the porch. I think I became interested in orchids when I learned, as a child, that vanilla beans come from orchids. I haven’t found any of that variety yet but I’m still looking. If you love flowers of every shape, size and color then Thailand is a place you will enjoy visiting. Lush gardens or just driving down the road is a source of beauty everywhere I’ve visited here. I hope you enjoy my little stories and I will try to give you one at least once a week. I sometime take the long way—time-wise- to get back to our little farm or return to Bangkok. 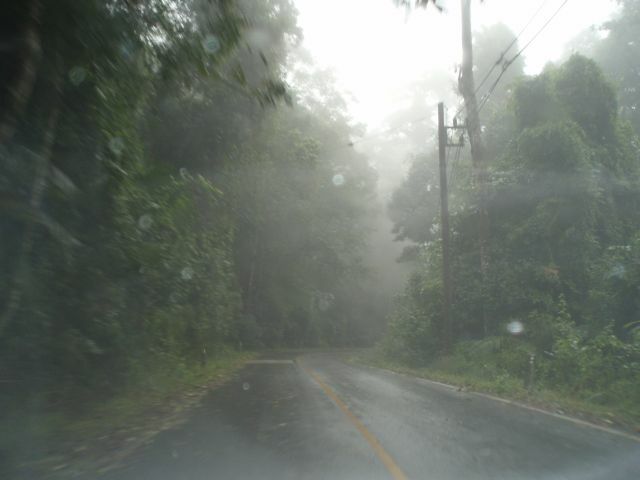 We travel over the mountains in Khow Yai National Park. The park has 60 kilometers of a winding mountain two lane road that goes from one side of the mountain range to the other side. The view is a tropical jungle of giant smooth barked trees with orchids growing high in their branches, sloping mountains and raging streams. 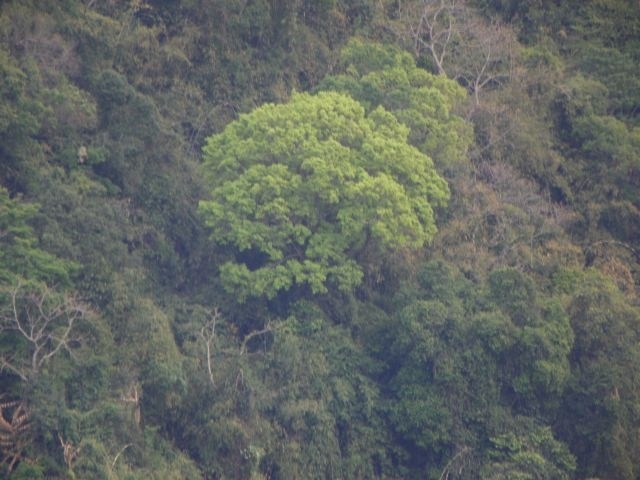 There’s also a stretch that runs along the ridge tops with open glades where any kind of jungle animals can be seen. Deer no bigger than a dog, Red Stags, Great Hornbill’s standing 2 feet tall, more monkeys than anyone wants to see and the mighty elephants. Elephants are Julee’s and my favorite. It’s hard for me to imagine something so big living free in Thailand. It only happens in the national parks. 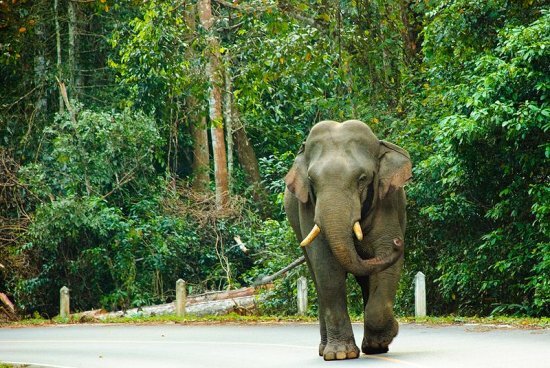 We usually travel across the mountains near sunset because that’s when the elephants come out of the jungle to walk the road to move to a new spot. They’re really smart using the roadway—so much easier than crashing through the jungle. But it’s not often that we get to see them. We were traveling down the mountain near a cascading river and it was almost completely dark. I saw something big ahead and slowed. It was a massive elephant and she was leading the way to a new feeding ground. I stopped and another car behind stopped 50 yards back and we turned our headlights off but left the parking lights on. My wife loves elephants but is also terrified of them. By now you probably know I’m too dumb to be afraid. Out of the dark marched a line of giant pachyderms in a slow easy pace. They were only two feet from the truck as they passed by. To my great delight there were two babies in the middle of the line and their trunks reached out inquisitively to sample everything around. The others kept close watch but allowed them to bounce and play as they passed by. I grabbed my camera and held it up until my beautiful wife threatened me with her knife-like finger. I started to say something, but that too was taboo. So I settled back to enjoy the spectacle without recording it. I watched a giant’s trunk reach out to examine the back of our truck and that’s when I remembered we had a basket of mangoes fresh picked from out farm. The elephant merely passed on by. I didn’t mention the mango part until we were home. Thank goodness. To be that close- I had rolled down the window and we could hear them breathe, smell them and hear the squeaks from the babies. To be that close was something akin to a perfect moment for Julee and me. To her it was more than perfect even in her fear. Elephants have a special place in the heart of every Thai. We see trained elephants often but to see them free is very special. I found out later from a ranger that the camera trick was—in his words—stupid! A number of cars are damaged every year by elephants merely brushing up against them but with babies—Don’t do that! Lesson learned until my next opportunity. We counted eighteen elephants in the herd and the ranger said that was the largest he had heard of. What a privilege to view them. Thank you for reading and I hope you enjoyed this little true story. If you like my writing you should try my fictions. You will enjoy them—I’m sure! 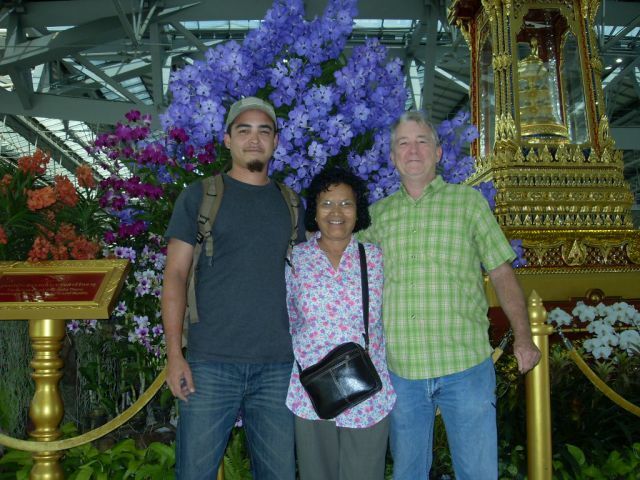 My first trip to Thailand became the journey that set me to return again and again. I was working and living in the Marshall Islands—two thousand miles west of Hawaii far from any other land. 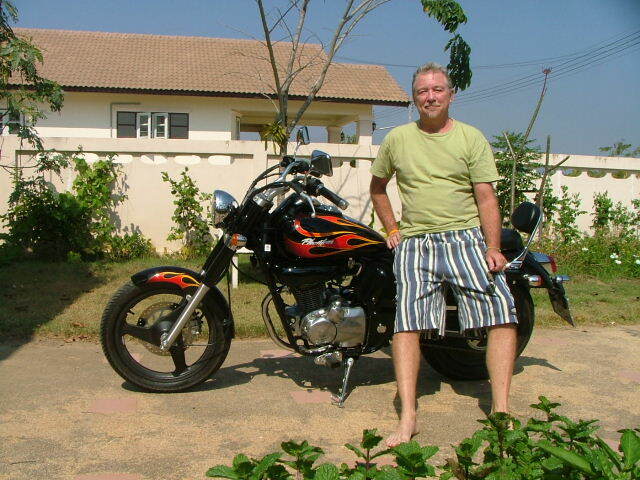 I had been in a war in Viet Nam and I fell in love with Asia. Even in the middle of a conflict I found the people exotic and interesting. Her English was poor but better than my Thai—since I spoke none. Her first words were, “Do you need a tour guide?” “Yes,” leaped from my lips and we arranged to meet that night. I had no idea what to expect but I knew I would agree to anything she had in mind. She admitted later she had never done anything like that before- but could see my heart was good. We spent a month touring all of the beautiful places in and around Bangkok and the nearby sea. My friends were off to the nightclubs for fun while I visited temples, street markets, and places of Thai history. She began to teach me Thai and I was determined to learn so I could express myself to this beauty. Later I often wondered how we got along so well. Neither of us could do more than speak in broken language, using our hands and smiles. She took me to the sleepy little village of Pattaya—which is now a major resort area. At the time there were a few hotels and one nightclub that I remember. We spent our days walking and exploring and even hired a fishing boat to take us to the outlying islands. 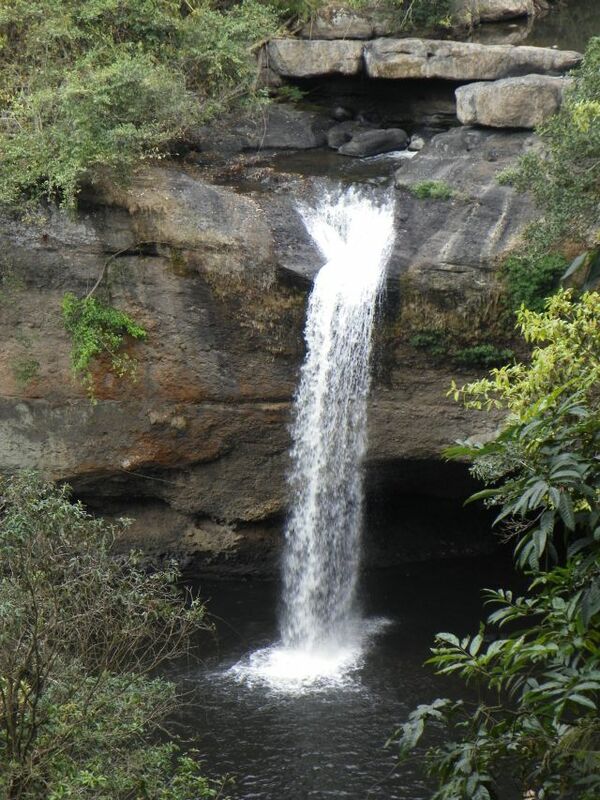 It was magical and I was completely in love with the country and this exotic beauty. Thailand then and even now is a bit like going back in time to a slower pace of life. The heat requires one to slow down as it seeps into one’s bones and relaxes. I had to return to the Marshalls and all I could think was how much I would miss Thailand and this rare flower that had captured my heart. I spoke the words I had never said to anyone before. Fear of those words was somehow ingrained in me not to say aloud. I told her I loved her and tears came to her and I thought I would be lost in her eyes. She spoke in Thai and then in English, words I never thought I would hear. She loved me! We made pledges and exchanged addresses—no email in those days—and I prepared to leave. I returned to the beautiful Pacific but my heart stayed in Thailand to be nurtured and held close. We wrote often and I had never put so much energy into writing words of love in a language that was so foreign to me. I had an English-Thai dictionary and two book on learning the Thai language. She had similar but also had a number of letters translated to English. Later we would laugh at my attempts but it was the effort she loved. Julee, my exotic beauty, became my wife and I brought her to my world with hope that we would one day return. We visited a few times and she went with our young children several other times while I had to stay home and work. Our children endeared me to her family. 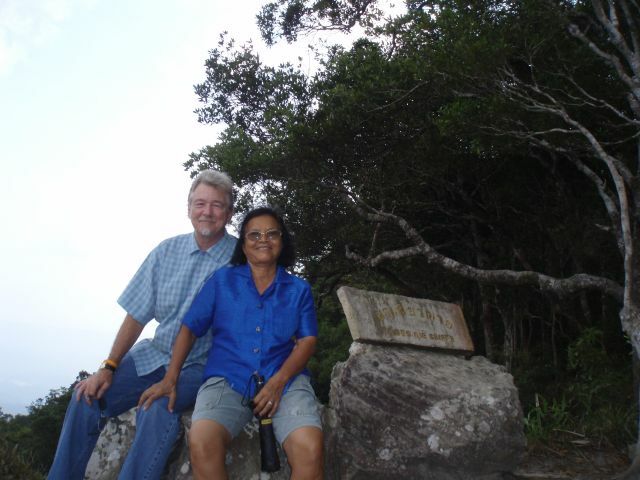 We have been married thirty-five years and have lived in Thailand for the past seven. My writer’s life would have not been possible if not for my exotic beauty! World Prairie, A Fantasy adventure coming later this year. For a look at this upcoming book go to my website. What you see now is me working out the kinks in my site. I still have much to learn and many things to say. I hope you will enjoy. I never, ever thought I would be blogging. Not because of lack of things to say– I’m full of stuff, lol– but living so far away from people I know and care for… Well, I didn’t think there would be an interest. I’ve had great response on Twitter and FB about the article I wrote for Lee Libro and the interview I did with Lorna Suzuki. They inspire me. I’m a novelist and learning to do short subjects isn’t easy for a long-winded guy like me, but I am learning. I hope you will comment often just so I’ll get to meet you! Get ready for A Writer in Thailand!!! I be back soon with articles I hope you will enjoy!